Damascus (AFP) – Syria has netted more than $500 million from passport fees this year, after raising charges for those obtained abroad to bolster foreign exchange reserves, the government said in a report Monday. The boost in fees comes amid soaring demand for passports, and with Syrians attempting to flee their war-ravaged country for Europe in record numbers. Damascus earlier this year eased the process for obtaining and renewing passports, while raising the cost of doing so. Al-Watan newspaper in June said Damascus was receiving some 5,000 passport requests a day from citizens inside and outside the country, a five-fold increase from 2014. The spike comes despite authorities doubling the cost of the process, requiring citizens abroad pay $400 for a new passport and $200 to renew one. Inside the country, a new passport costs about $17. When the government announced it was easing the procedures in June, it said the new fees would be “an important source of foreign exchange”. And on Monday, Al-Watan said passport fees were bringing in millions of dollars to bolster Syria’s dwindling foreign reserves. “The revenue (from issuing passports) this year reached $520 million overseas,” the newspaper quoted the emigration department as saying. Passports issued inside the country have netted the government $8 million this year so far, the newspaper added. The daily said some 829,000 passports had been issued this year at home and abroad, or about 3,000 a day. Syria’s currency has plunged since the beginning of the conflict in 2011, dropping from 50 pounds to the dollar to 300 pounds this year, with foreign reserves falling in parallel. Separately, trafficking in false passports, which cost between $5,000 and $6,000, has also risen, the emigration department told Al-Watan. The conflict has displaced around half the population, with more than four million becoming refugees. Most of them have taken refuge in neighbouring countries, but in recent months tens of thousands of Syrians have joined a wave of migrants and refugees seeking asylum in Europe. 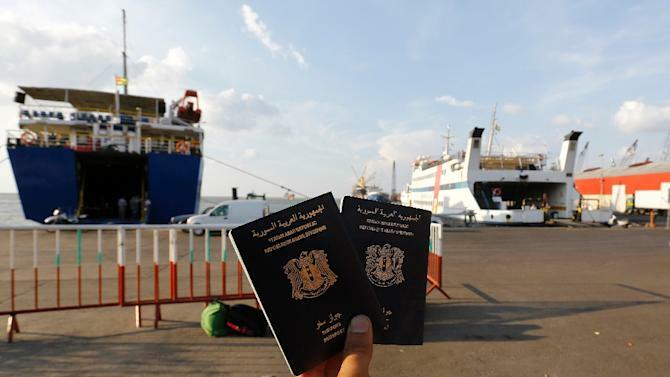 Al-Watan said European countries including Sweden, Denmark and Norway had “felt the danger” of the flows of refugees and sent delegations to Syria to learn how to spot fake documents.